The fascinating story of Athanasius Kircher, the eccentric scholar-inventor who was either a great genius or a crackpot… or a bit of both. The interests of Athanasius Kircher, the legendary seventeenth-century priest-scientist, knew no bounds. From optics to music to magnetism to medicine and Atlantis, he offered up inventions and theories for everything, and they made him famous across Europe. His celebrated museum in Rome featured magic lanterns, speaking statues, the tail of a mermaid, and a brick from the Tower of Babel. Holy Roman Emperors were his patrons, popes were his friends, and in his spare time he collaborated with the Baroque master Bernini. But Kircher lived during an era of radical transformation, in which the old approach to knowledge—what he called the “art of knowing”—was giving way to the scientific method and modern thought. A Man of Misconceptions traces the rise, success, and eventual fall of this fascinating character as he attempted to come to terms with a changing world. With humor and insight, John Glassie returns Kircher to his rightful place as one of history’s most unforgettable figures. Published at $26.95, our price only $16.95! 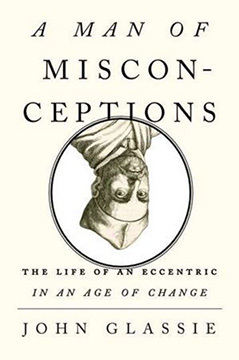 A MAN OF MISCONCEPTIONS: The Life of an Eccentric in an Age of Change By John Glassie. 352 Pages. 6x9 Hardback. Illustrated. Index.